It’s time for the 2018 season! I was so happy to get back on track this past weekend for Global Mazda MX-5 Cup Spring Training at Barber Motorsports Park. 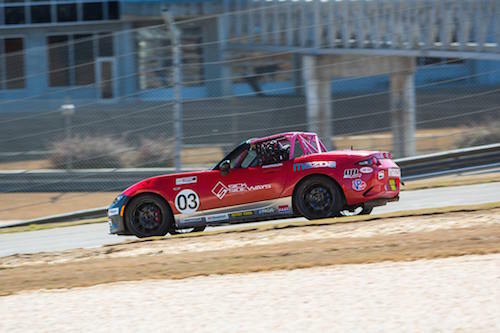 I’m working with Sick Sideways for the first time, and the weekend was a really positive start to the season for me and my Harrison Contracting MX-5. I had my 24th birthday while I was there, and I can’t imagine a better way to celebrate than by being on the track. The car was hooked up right off the bat, and we were top eight in the first session. We were sixth on the time sheets by the end of day one, and just half a second off of first, so it was a positive, successful first day. We put on stickers the next day, and those were worth another second off my lap time! We continued to set the car up, and we got as high as third in the second session of the day. We ended day two with the seventh-fastest time of the weekend. I realize that you can’t win practice, but Spring Training gave us a great gauge for what to expect in the season to come, and it’s the highest I’ve ever been on the time sheets in MX-5 Cup practice. And in other news, in case you missed it, I’m now partnered with Molecule Sports. They help keep your gear clean, whether you’re playing hockey, doing yoga, racing cars, or any other activity that can work up a sweat. Molecule Sport cleans your gear and keeps it fresh. If you want to try it out, use my code for a discount of 15% off your orders: Ash15. Sarah Montgomery and I are continuing our work to secure funding for our TCR program, but in the meantime, I am so happy to be back in the Harrison Contracting MX-5 Cup car, and I’m really looking forward to this season after such a great start to testing. It’s going to be an exciting season, so make sure you keep up with my blog and Facebook page for all the details and race reports!